"Pencapaian kecemerlangan dalam arahan sinematik"
Anugerah Akademi untuk Pengarah Terbaik (secara rasmi dikenali sebagai Anugerah Akademi untuk Arahan Terbaik) ialah sebuah anugerah dipersembahkan setiap tahun oleh Akademi Sains dan Seni Perfileman (AMPAS). Ia diberi sebagai penghormatan kepada pengarah filem yang telah menunjukkan arahan luar biasa semasa bekerja dalam industri perfileman. Anugerah Akademi Pertama diadakan pada tahun 1929 dimana anugerah itu dibahagikan kepada kategori Dramatik dan Komedi; Frank Borzage dan Lewis Milestone menang menerusi Seventh Heaven dan Two Arabian Knights. Walau bagaimanapun, kategori-kategori ini digabungkan untuk kesemua majlis susulan. Untuk sebelas tahun pertama Anugerah Akademi, pengarah-pengarah dibenarkan untuk dicalonkan lebih daripada satu filem dalam tahun yang sama. Walau bagaimanapun, selepas Michael Curtiz dicalonkan untuk dua filem, Angels with Dirty Faces dan Four Daughters di Anugerah Akademi ke-11, peraturan telah disemak semula supaya individu hanya boleh dicalonkan untuk satu filem pada setiap majlis. Peraturan ini sejak itu telah dipinda tetapi satu-satunya pengarah yang menerima lebih daripada satu pencalonan pada tahun yang sama adalah Steven Soderbergh untuk Erin Brockovich dan Traffic pada tahun 2000. Sejak penubuhannnya, anugerah ini telah diberikan kepada 69 pengarah atau pasukan pengarah. John Ford memenangi anugerah terbanyak dalam kategori ini dengan empat anugerah. William Wyler telah dicalonkan sebanyak dua belas kali, lebih banyak dari mana-mana individu lain. 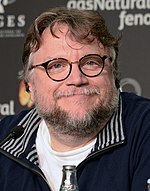 Setakat majlis anugerah tahun 2018, Guillermo del Toro adalah pemenang terbaru dalam kategori ini untuk kerjayanya di dalam filem The Shape of Water. ^ Dirks, Tim. "1927–28 Academy Awards Winners". Rainbow Media. Dicapai November 20, 2015. ^ Dirks, Tim. "Academy Awards Winners (1927/8 – 1939)". Rainbow Media. Dicapai November 20, 2015. ^ Dirks, Tim. "1938 Academy Awards Winners and History". Rainbow Media. Dicapai November 20, 2015. ^ "The 1st Academy Awards (1929) Nominees and Winners". Academy of Motion Picture Arts and Sciences (AMPAS). Dicapai August 27, 2013. ^ "The 2nd Academy Awards Nominees and Winners". Academy of Motion Picture Arts and Sciences. Dicapai August 27, 2013. ^ "The 3rd Academy Awards (1930) Nominees and Winners". Academy of Motion Picture Arts and Sciences. Dicapai August 27, 2013. ^ "The 4th Academy Awards (1931) Nominees and Winners". Academy of Motion Picture Arts and Sciences. Dicapai August 27, 2013. ^ "The 5th Academy Awards (1932) Nominees and Winners". Academy of Motion Picture Arts and Sciences. Dicapai August 27, 2013. ^ "The 6th Academy Awards (1933) Nominees and Winners". Academy of Motion Picture Arts and Sciences. Dicapai August 27, 2013. ^ "The 7th Academy Awards (1935) Nominees and Winners". Academy of Motion Picture Arts and Sciences. Dicapai August 27, 2013. ^ "The 8th Academy Awards (1936) Nominees and Winners". Academy of Motion Picture Arts and Sciences. Dicapai August 27, 2013. ^ "The 9th Academy Awards (1937) Nominees and Winners". Academy of Motion Picture Arts and Sciences. Dicapai August 27, 2013. ^ "The 10th Academy Awards (1938) Nominees and Winners". Academy of Motion Picture Arts and Sciences. Dicapai August 27, 2013. ^ "The 11th Academy Awards (1939) Nominees and Winners". Academy of Motion Picture Arts and Sciences. Dicapai August 27, 2013. ^ "The 12th Academy Awards (1940) Nominees and Winners". Academy of Motion Picture Arts and Sciences. Dicapai August 27, 2013. ^ "The 13th Academy Awards (1941) Nominees and Winners". Academy of Motion Picture Arts and Sciences. Dicapai August 27, 2013. ^ "The 14th Academy Awards (1942) Nominees and Winners". Academy of Motion Picture Arts and Sciences. Dicapai August 27, 2013. ^ "The 15th Academy Awards (1943) Nominees and Winners". Academy of Motion Picture Arts and Sciences. Dicapai August 27, 2013. ^ "The 16th Academy Awards (1944) Nominees and Winners". Academy of Motion Picture Arts and Sciences. Dicapai August 27, 2013. ^ "The 17th Academy Awards (1945) Nominees and Winners". Academy of Motion Picture Arts and Sciences. Dicapai August 27, 2013. ^ "The 18th Academy Awards (1946) Nominees and Winners". Academy of Motion Picture Arts and Sciences. Dicapai August 27, 2013. ^ "The 19th Academy Awards (1947) Nominees and Winners". Academy of Motion Picture Arts and Sciences. Dicapai August 27, 2013. ^ "The 20th Academy Awards (1948) Nominees and Winners". Academy of Motion Picture Arts and Sciences. Dicapai August 27, 2013. ^ "The 21st Academy Awards (1949) Nominees and Winners". Academy of Motion Picture Arts and Sciences. Dicapai August 27, 2013. ^ "The 22nd Academy Awards (1950) Nominees and Winners". Academy of Motion Picture Arts and Sciences. Dicapai August 27, 2013. ^ "The 23rd Academy Awards (1951) Nominees and Winners". Academy of Motion Picture Arts and Sciences. Dicapai August 27, 2013. ^ "The 24th Academy Awards (1952) Nominees and Winners". Academy of Motion Picture Arts and Sciences. Dicapai August 27, 2013. ^ "The 25th Academy Awards (1953) Nominees and Winners". Academy of Motion Picture Arts and Sciences. Dicapai August 27, 2013. ^ "The 26th Academy Awards (1954) Nominees and Winners". Academy of Motion Picture Arts and Sciences. Dicapai August 27, 2013. ^ "The 27th Academy Awards (1955) Nominees and Winners". Academy of Motion Picture Arts and Sciences. Dicapai August 27, 2013. ^ "The 28th Academy Awards (1956) Nominees and Winners". Academy of Motion Picture Arts and Sciences. Dicapai August 27, 2013. ^ "The 29th Academy Awards (1957) Nominees and Winners". Academy of Motion Picture Arts and Sciences. Dicapai August 27, 2013. ^ "The 30th Academy Awards (1958) Nominees and Winners". Academy of Motion Picture Arts and Sciences. Dicapai August 27, 2013. ^ "The 31st Academy Awards (1959) Nominees and Winners". Academy of Motion Picture Arts and Sciences. Dicapai August 27, 2013. ^ "The 32nd Academy Awards (1960) Nominees and Winners". Academy of Motion Picture Arts and Sciences. Dicapai August 27, 2013. ^ "The 33rd Academy Awards (1961) Nominees and Winners". Academy of Motion Picture Arts and Sciences. Dicapai August 27, 2013. ^ "The 34th Academy Awards (1962) Nominees and Winners". Academy of Motion Picture Arts and Sciences. Dicapai August 27, 2013. ^ "The 35th Academy Awards (1963) Nominees and Winners". Academy of Motion Picture Arts and Sciences. Dicapai August 27, 2013. ^ "The 36th Academy Awards (1964) Nominees and Winners". Academy of Motion Picture Arts and Sciences. Dicapai August 27, 2013. ^ "The 37th Academy Awards (1965) Nominees and Winners". Academy of Motion Picture Arts and Sciences. Dicapai August 27, 2013. ^ "The 38th Academy Awards (1966) Nominees and Winners". Academy of Motion Picture Arts and Sciences. Dicapai August 27, 2013. ^ "The 39th Academy Awards (1967) Nominees and Winners". Academy of Motion Picture Arts and Sciences. Dicapai August 27, 2013. ^ "The 40th Academy Awards (1968) Nominees and Winners". Academy of Motion Picture Arts and Sciences. Dicapai August 27, 2013. ^ "The 41st Academy Awards (1969) Nominees and Winners". Academy of Motion Picture Arts and Sciences. Dicapai August 27, 2013. ^ "The 42nd Academy Awards (1970) Nominees and Winners". Academy of Motion Picture Arts and Sciences. Dicapai August 27, 2013. ^ "The 43rd Academy Awards (1971) Nominees and Winners". Academy of Motion Picture Arts and Sciences. Dicapai August 27, 2013. ^ "The 44th Academy Awards (1972) Nominees and Winners". Academy of Motion Picture Arts and Sciences. Dicapai August 27, 2013. ^ "The 45th Academy Awards (1973) Nominees and Winners". Academy of Motion Picture Arts and Sciences. Dicapai August 27, 2013. ^ "The 46th Academy Awards (1974) Nominees and Winners". Academy of Motion Picture Arts and Sciences. Dicapai August 27, 2013. ^ "The 47th Academy Awards (1975) Nominees and Winners". Academy of Motion Picture Arts and Sciences. Dicapai August 27, 2013. ^ "The 48th Academy Awards (1976) Nominees and Winners". Academy of Motion Picture Arts and Sciences. Dicapai August 27, 2013. ^ "The 49th Academy Awards (1977) Nominees and Winners". Academy of Motion Picture Arts and Sciences. Dicapai August 27, 2013. ^ "The 50th Academy Awards (1978) Nominees and Winners". Academy of Motion Picture Arts and Sciences. Dicapai August 27, 2013. ^ "The 51st Academy Awards (1979) Nominees and Winners". Academy of Motion Picture Arts and Sciences. Dicapai August 27, 2013. ^ "The 52nd Academy Awards (1980) Nominees and Winners". Academy of Motion Picture Arts and Sciences. Dicapai August 27, 2013. ^ "The 53rd Academy Awards (1981) Nominees and Winners". Academy of Motion Picture Arts and Sciences. Dicapai August 27, 2013. ^ "The 54th Academy Awards (1982) Nominees and Winners". Academy of Motion Picture Arts and Sciences. Dicapai August 27, 2013. ^ "The 55th Academy Awards (1983) Nominees and Winners". Academy of Motion Picture Arts and Sciences. Dicapai August 27, 2013. ^ "The 56th Academy Awards (1984) Nominees and Winners". Academy of Motion Picture Arts and Sciences. Dicapai August 27, 2013. ^ "The 57th Academy Awards (1985) Nominees and Winners". Academy of Motion Picture Arts and Sciences. Dicapai August 27, 2013. ^ "The 58th Academy Awards (1986) Nominees and Winners". Academy of Motion Picture Arts and Sciences. Dicapai August 27, 2013. ^ "The 59th Academy Awards (1987) Nominees and Winners". Academy of Motion Picture Arts and Sciences. Dicapai August 27, 2013. ^ "The 60th Academy Awards (1988) Nominees and Winners". Academy of Motion Picture Arts and Sciences. Dicapai August 27, 2013. ^ "The 61st Academy Awards (1989) Nominees and Winners". Academy of Motion Picture Arts and Sciences. Dicapai August 27, 2013. ^ "The 62nd Academy Awards (1990) Nominees and Winners". Academy of Motion Picture Arts and Sciences. Dicapai August 27, 2013. ^ "The 63rd Academy Awards (1991) Nominees and Winners". Academy of Motion Picture Arts and Sciences. Dicapai August 27, 2013. ^ "The 64th Academy Awards (1992) Nominees and Winners". Academy of Motion Picture Arts and Sciences. Dicapai August 27, 2013. ^ "The 65th Academy Awards (1993) Nominees and Winners". Academy of Motion Picture Arts and Sciences. Dicapai August 27, 2013. ^ "The 66th Academy Awards (1994) Nominees and Winners". Academy of Motion Picture Arts and Sciences. Dicapai August 27, 2013. ^ "The 67th Academy Awards (1995) Nominees and Winners". Academy of Motion Picture Arts and Sciences). Dicapai August 27, 2013. ^ "The 68th Academy Awards (1996) Nominees and Winners". Academy of Motion Picture Arts and Sciences). Dicapai August 27, 2013. ^ "The 69th Academy Awards (1997) Nominees and Winners". Academy of Motion Picture Arts and Sciences. Dicapai August 27, 2013. ^ "The 70th Academy Awards (1998) Nominees and Winners". Academy of Motion Picture Arts and Sciences. Dicapai August 27, 2013. ^ "The 71st Academy Awards (1999) Nominees and Winners". Academy of Motion Picture Arts and Sciences. Dicapai August 27, 2013. ^ "The 72nd Academy Awards (2000) Nominees and Winners". Academy of Motion Picture Arts and Sciences. Dicapai August 27, 2013. ^ "The 73rd Academy Awards (2001) Nominees and Winners". Academy of Motion Picture Arts and Sciences. Dicapai August 27, 2013. ^ "The 74th Academy Awards (2002) Nominees and Winners". Academy of Motion Picture Arts and Sciences. Dicapai August 27, 2013. ^ "The 75th Academy Awards (2003) Nominees and Winners". Academy of Motion Picture Arts and Sciences. Dicapai August 27, 2013. ^ "The 76th Academy Awards (2004) Nominees and Winners". Academy of Motion Picture Arts and Sciences. Dicapai August 27, 2013. ^ "The 77th Academy Awards (2005) Nominees and Winners". Academy of Motion Picture Arts and Sciences. Dicapai August 27, 2013. ^ "The 78th Academy Awards (2006) Nominees and Winners". Academy of Motion Picture Arts and Sciences. Dicapai August 27, 2013. ^ "The 79th Academy Awards (2007) Nominees and Winners". Academy of Motion Picture Arts and Sciences. Dicapai August 27, 2013. ^ "The 80th Academy Awards (2008) Nominees and Winners". Academy of Motion Picture Arts and Sciences. Dicapai August 27, 2013. ^ "The 81st Academy Awards (2009) Nominees and Winners". Academy of Motion Picture Arts and Sciences. Dicapai August 27, 2013. ^ "The 82nd Academy Awards (2010) Nominees and Winners". Academy of Motion Picture Arts and Sciences. Dicapai August 27, 2013. ^ "The 83rd Academy Awards (2011) Nominees and Winners". Academy of Motion Picture Arts and Sciences. Dicapai August 27, 2013. ^ "The 84th Academy Awards (2012) Nominees and Winners". Academy of Motion Picture Arts and Sciences. Dicapai August 27, 2013. ^ "The 85th Academy Awards (2013) Nominees and Winners". Academy of Motion Picture Arts and Sciences. Dicapai August 27, 2013. ^ "The 86th Academy Awards (2014) Nominees and Winners". Academy of Motion Picture Arts and Sciences. Dicapai April 10, 2014. ^ "The 87th Academy Awards (2015) Nominees and Winners". Academy of Motion Picture Arts and Sciences. Dicapai January 15, 2015. Laman ini diubah buat kali terakhir pada 19:57, 6 Mac 2018.